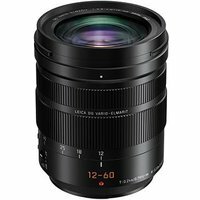 The Panasonic 12-60mm f2.8-4.0 Leica DG Vario-Elmarit Power O.I.S. Lens with Micro Four Thirds fit is a versatile zoom capable of smooth, silent operation for both stills and video. Suitable for a variety of shooting situations, its wide f2.8-4.0 aperture provides a beautiful defocus effect, whilst the POWER Optical Image Stabiliser compensates for blurring, allowing for handheld shooting even in dimly lit environments. The lens also features a compact, rugged, splash- and dust-proof design.